This category will keep your club up to date on the best players in Scandinavia. The players will be judged on several criteria’s such as; talent, potential, how they perform, transfer value, contract status etc. The list of players will be updated on a monthly basis. Use contact page to get in touch if your club wants scouting reports on any players in Scandinavia. All material can be translated into your required language. The report contains information such as highlighting the players’ strengths and weaknesses. We also put an extra focus on the players approach on the training field as well as the social bit. At last full match-report with the player scouted on is described in full details. For the player to be recommended and approved by Scandinavian scouting agency it is utterly important for us to bring all the information on the table so that your club investment is looked carefully after. Since we don`t work with any agents I feel that we are a more reliable source than football agents when judging a players potential. Example on reports are delivered for free to club-representatives on request. Please use the contact page for contacting us. The list was last updated on 11.09.2012. – Mahlangu have had a bit of slow start to the season, but the more matches he`s played the better he`s been. His form-top came in good time as Helsingborg were trying to get into the Champions League and fighting for the title in the Swedish league. Even though Helsingborg lost to Celtic FC I felt that May Mahlangu showed that he has that extra gear to play at a higher level. Especially in the first leg he played some really good football and quite frankly he should have scored at least one goal there. His passing and energy were at the highest standard which I hope bigger clubs also saw. The return leg back in Scotland was always going to be a difficult leg after losing 0-2 at home. Nevertheless he tried to play his part, but it was clear to me that. Not only Mahlangu, but the entire team was kind of gob smacked after the first legs result. The match ended 2-0 which saw Celtic FC go through after 4-0 on aggregate. Even if the Swedes lost by a clear margin I felt that the midfields between the two teams were quite even in the terms of quality. All credit to Mahlangu for stabilizing their midfield with his running and passing. The major difference between the two sides was, not surprisingly, the lack of quality up front. I am excited about watching Mahlangu and his teammates for the reminder of the season. Hopefully Mahlangu will keep playing his own game and stay focused on achieving things here in Sweden at the moment. His chances of playing in bigger leagues will come sooner rather than later. Undoubtedly he was the best player in the Swedish league last season. He was the architect in the middle of the park behind his team success. South Africa gave him a much deserve debut on the national team which obviously didn`t do any clubs any favor in trying to land the midfielder for cheap. His passing, vision and stamina makes him able to play at the highest level so it would be very interesting to see which club who is able to sign the player. With Helsingborg losing to Celtic FC in the Champions League, they will be more reluctant to let him leave for a sensible price. 2. Jores Okore, FC Nordsjælland – Central defender. – FC Nordsjælland won the league last year and lots of credit has to be given to Okore and his former partner in Andreas Bjelland who left for Twente this year. Interest around Okore were always going to happen during the summer, but still he`s playing in Denmark. The club has made him vice-captain of the club and given him lots more responsibility than last year. While Bjelland where the player who were the natural leader in defense last year, this is now Okore`s job. This is a task it just seems like he`s been waiting for as he`s like an natural leader on the field. I am honestly very pleased about him staying in the Danish league a bit longer as it means that we all will have the pleasure of watching him and his team against Chelsea, Juventus and Shaktar Donetsk in the Champions League. A great learning lesson for him to just feel the level these are operating at. I wouldn`t at all be surprised if some of the clubs in the Champions League will make a bid for him in the January transfer window as he is capable of handling players at such level. Still he is young, but this experience will mature him a lot as a player. Focused on the upcoming Champions League matches haven’t had an impact on the team in the Danish league. They are playing their own style of passing-orientated football and are fighting for the top spots along with last season’s silver medalist FC Copenhagen. Jores Okore has contributed this season just as he did last season so things are looking shiny at the moment. His performances haven’t gone unnoticed by Danish national team coach, Morten Olsen who included him in the squad for the upcoming fixture against Czech Republic. Written earlier about Jores Okore: Haven`t we all heard descreptions of players such as “the beast” or “the hulk”? If you were to label Okore in any specific category you would immediately be intimated by his strength. He`s a powerful central defender who reads the game brilliantly. When required he storms into every challenge with great amount of power and accuracy. Denmark keeps producing central defenders of the highest standard. 19 year old Okore is probably the player with the highest potential that we have seen for a while. In his first full season for Nordsjælland he hasn`t disappointed anyone. He has adapted quickly to his team passing style of play. In fact this gives him an advantage and, if possible, makes him even more attractive for bigger clubs outside Scandinavia. In January he got his debut for his national team and he didn’t let anyone down. I was impressed by his calmness in defense. He wasn’t afraid of taking his time in finding the best solution. It`s the same when he`s playing for his club. I don’t hide the fact that central defenders who is confident on the ball is of my likening. The player himself is eager to prove himself in England and that is something that is bound to happen. But the lad turned 19 recently and wisely he committed himself to Nordsjælland until 2016. Their football style fits him perfectly and if he can stay in Denmark a bit more it will benefit him a lot – both on and off the pitch. However, time and pressure to act fast is a key factor in modern football. If the smaller clubs wait too long they are bound to miss out on Okore. The race is on, but Nordsjælland are in a good position when negotiation a fair prize for his services. Will they offload the player during the summer? It`s a cliché saying “only if the money is right”, but in this case it is. I believe only silly money will tempt them to sell and I don`t think Okore is in any rush of leaving Denmark. With European cup already secured there is exciting times ahead for both Nordsjælland-supporters and players. – I`ve had the pleasure of watching the player dominating in the Norwegian league before leaving for the Danish capital in 2010. He took the Norwegian league by storm so I was not surprised that he nearly immediately delivered the goods for FC Copenhagen. I would like to put in a link just so that people knows what of good he is capable of delivering. This clip is from his period in Norway where his team Start played Tromsø IL back in 2009: http://www.youtube.com/watch?v=n8Io7s_56Kg It gives you a sense of what brilliance he`s capable of doing. So in Norway he scored some stunning goals and in Denmark he has a decent goal scoring record as well. I would say he is more capable of scoring more goals for FC Copenhagen, but they need his delivering skills more than his goals – how odd that may seem. But put into account that Dame N`Doye where playing with them until he changed for Lokomotiv Moskva a few months ago. He`s a constant threat for defenders as he is always likely to take them on one on one. His movement ability enables him to cut in through the middle making him difficult to read for defenders. By using his speed and movement he opens up a lot of space for his other teammates. His vision of the game is one of his top qualities. His technical skills combined with his passing and crossing skills makes him a handful for opponents also outside of the Scandinavian league. He has proven this in the Champions League and will this season have a go against the second best in the Europa League. Undoubtedly the best right winger in the Danish league, and with Bolanius turning 29 next year it is only a matter of time before he leaves for a bigger league. – Back in 2008 I met represents from a German club. We talked about famous players who had arrived from Scandinavia to their club in the past. They were always looking for new talented players and asked me whether I could give them tips about new upcoming players from Norway. I threw Vegard Forren on the table and started to describe his to them. As you learn in the business it is just as important to give full details about the player’s weaknesses as it is to his strengths. In short I was telling them that we were dealing with a player who was, in a few years, capable of playing in the big leagues. For me it was just a statement so that they would know what I was all about – see potential in a player and predict where his future lays. 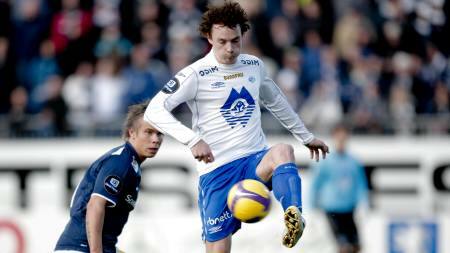 They didn`t sign the player, but Forren continued to play for Molde on a regular basis. In this case I am very glad that he continued to play in the Norwegian league, and especially since the arrival of Ole Gunnar Solskjaer the player has taken those extra steps needed to be ready for bigger tasks. His performances this season stands out as his best ever. The performance against Heerenveen was absolutely brilliant and by this he showed to any doubters what he is all about. Good in the air, strong tackler, good reading the game and he`s a defender who isn’t intimidated by receiving the ball in the buildup play. He`s improved a lot in all of these areas by keep playing in the Norwegian, and allowing himself to mature as a player. He obviously wants to play at a higher level, but he`s been biding his time and stayed focus as he knows that if he delivers in the Norwegian league he will soon get his chance. With Molde FK entering the group stage of the Europa League something tells me that their opponents are in for a surprised. For one should not forget that Molde FK were only a missed penalty away from entering the last qualifaction round before the group stage of the Champions league. With Solskjær on board as a manager the whole team has adapted into the passing mentality of play – which eventually suits Forren perfectly. He just recently, only a matter of time really, got called up for the Norwegian national team. If the Norwegian national team were going to move forward they national team coach needed to bring in players such as Vegard Forren and Magnus Wolf Eikrem. 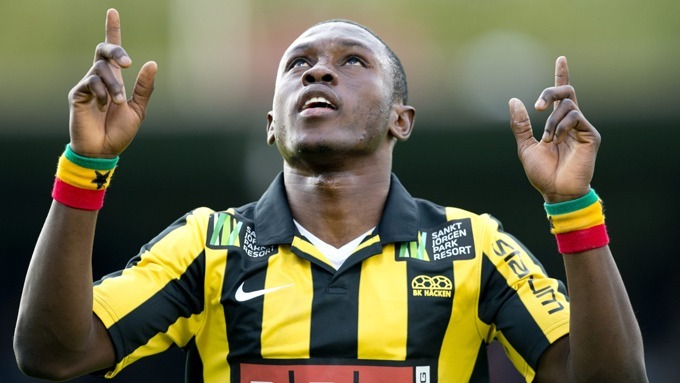 – After Häcken sold their top striker, Mattias Ranegiè, it was finally Waris Majeed chance to shine. His dedicated hard work on the training pitch was shown in his first match of the season. I sat ringside and made a few notes and I could alert a few clubs already then about the young powerful striker. He didn’t have a good match, but he gave evidence of what a scout is looking for in a striker. After 16 matches he is now the top goal scorer in the league – I am not at all surprised. He is not the tallest players, but probably the most powerful and muscular player I`ve seen in his weight class. 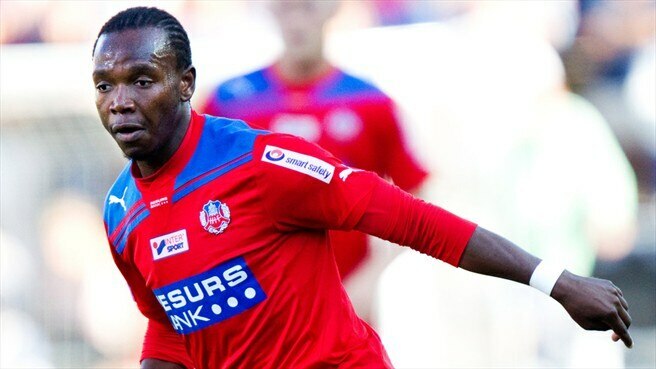 His 5 goals in a match against Norrkøping caught the eye for some hopeful clubs in Scandinavia. Poor defending from the opposition shouldn’t take credit away from Waris and his finishing. He is a lively player who is a constant threat for any opponent. His pace and powerful shots stands out as his major qualities. He has got ambition to play at a higher level, but in my mind I will be surprise if any Scandinavian clubs are able to get his signature. Asking price of around 2,5 million Euro surely will scare some clubs off. However, 17 league goals in his first full season are impressive so things might happen during the next window if he can keep delivering on the pitch.